Veins are the blood vessels that take the blood back to the heart and lungs ready to be re-oxygenated and pumped back around the body. In order for the veins to take the blood back to the heart they contain valves that prevent the blood flowing the wrong way. When these valves weaken and stop working properly the veins can become varicose. 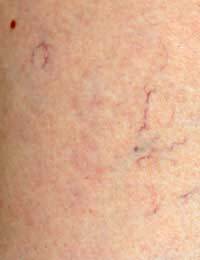 When a vein is varicose it can appear to bulge out of the skin and become a lot more noticeable. They can sometimes look lumpy or twisted and be darker in colour, usually a purple or blue. Some people may not experience any symptoms other than their appearance but for others the legs can ache or feel quite painful. It is not unusual to experience a burning sensation or a throbbing in the affected area but these can be lessened by keeping the legs cool and by resting frequently. It may be that no reason may be found as to why your veins have become varicose. For others it may be that it is a genetic occurrence and cannot be avoided.It has been found that the female hormones may lead to weakening of the blood vessels so women might be more at risk. It is also thought that being overweight is a significant factor as the veins have to support a greater body weight and have more work to do to get the blood back to he heart and lungs.Pregnancy may also be a cause as the circulation changes to support the growing baby and in the later stages the blood in the legs is lessened because of the demands of the baby and the increase in body weight putting pressure on the vessels. If you are not suffering from any symptoms other than cosmetic ones it is likely that they will not need treatment.Most varicose veins do not cause problems with the circulation as other blood vessels will compensate for the damaged ones.It is possible that treatment can be pursued through private treatment if the NHS deems yours not to warrant treatment. If treatment is recommended the use of chemicals may be used. These chemicals are injected into the vein with the help of ultrasound scanning techniques and work by scarring the vessel and preventing them from working. It is possible to have surgery for the treatment of varicose veins and this may be carried out as a day patient if there are no complications or any medical problems concerning the patient.Following administration of a general anaesthetic, the surgeon will make a small incision in your groin and another at the ankle, the affected veins will be located and a guide wire passed through. It is then dissected and tied off at one end and ‘stripped’ from the other end and removed. When the affected vessels have been removed tight bandaging is necessary to prevent bleeding. The bandages will start at your ankle and continue to your groin.Recovery normally takes around 3 weeks. As it is thought that standing in one position for long periods may contribute to varicose vein development it is advised that foot and ankle exercises are undertaken to try and prevent the veins from being damaged. Some occupations may require you to stand for long periods as well so it is important to wear comfortable footwear and adjust position when able to encourage a healthy blood flow through the lower body and limbs. Losing weight and stopping smoking will do wonders for your circulation and avoid many complaints and illnesses from developing. By encouraging a healthy blood pressure your heart and blood vessels will not have to work as hard to pump the blood around the body.When sitting avoid crossing your legs or tucking them under your body as this forces the veins to have to work harder to push the blood in the right direction. If you feel your legs are aching and the circulation has become affected, try wearing compression stockings throughout the day as these help the blood flow in the right direction and will help to prevent and damage to the vein from worsening. Varicose veins are a common but often not a serious problem. They may cause some discomfort but your overall circulation should be affected. Many people seek treatment if their discomfort worsens or the veins have become particularly unsightly, but it is not always necessary. What a great article! I can tell you really care about what you are writing about, which is a rare thing these days. Thank you for bringing this information out, it's much appreciated!